To inspire or be inspired? For one artist, it's both. Children often inspire Patrick Saunders' work, while he encourages interest in art. Patrick Saunders' upstairs studio is entertaining for any child - especially a child who grew up in the 1970s. "Star Wars" action figures - storm troopers, Darth Vaders, the whole crew - cover Saunders' walls and fill shelves. Ships hang from the ceiling, a reminder of the movies that inspired some of his first childhood drawings. "It was like, 'Wow, I didn't know things could be that cool,'" the Overland Park artist said, remembering his initial awe that was shared by countless other boys who watched the initial trilogy. Saunders still finds the toys inspirational in a childlike way. And childhood remains a time he likes exploring in his paintings now that he's an adult. In his commissioned work, as well as in his personal pieces, Saunders often paints children. The 33-year-old also enjoys inspiring youngsters. Before beginning a recent portrait, Saunders even let the children paint on the canvas he would use so they would feel like a part of the process. "Art sometimes can be intimidating to people," said Eva Reynolds of Eva Reynolds Fine Arts, Saunders' representative. "He makes his process much more friendly." Saunders paints from life, but he won't firmly classify his work as realism. His brush leaves softer lines, not hard edges. Painting wasn't Saunders' focus until after college. He studied illustration at the Kansas City Art Institute but found a shrinking market for that work after graduation. He soon joined Hallmark and began making plans to leave when he was confident he could support himself on his own work. It took 10 years, but Saunders finally shortened his commute in May, 2002. He now paints from the studio of the 1940s house he and his wife, Kimberly, are remodeling. His 12-hour workdays now include time to go to museums and look through books so he can study the work of other artists. He aims to push his limits. "It's like practicing a musical instrument," Saunders said. "You just get better and better the more you practice. "He has developed a system for capturing his subjects, especially children who are too wiggly to sit still for a painter. Saunders first takes pictures of the children. "He talks to them while he takes photographs,&quot; Reynolds said. " It's not like they have to sit there still and smile. He plays with them. ...They feel much more at ease, and so it's more natural." Saunders combines several photos into one picture - a process he calls "Frankensteining." He'll use the facial expression from one picture and the angle of an arm from another. "Then I get the spontaneity I want," he said. He then sketches what he plans to paint before taking his work to canvas. Saunders' work has earned recognition. 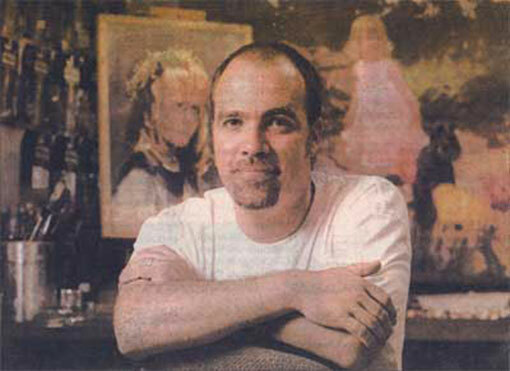 In 2001, Southwest Art magazine featured him in a piece about 21 artists to watch who were 31 years old or younger. In May, his painting of a man, "Wess" was included in the Oil Painters of America National Juried Exhibition at the Nichols Taos Fine Art Gallery in Taos, N.M.
"I got to hang next to all the artists I studied in college, and my piece sold to a European collector," Saunders said. When he gives presentations to grade school children, he enjoys telling kids who love art that they can be artists and make a living. "A lot of times you get through to them, and they get really excited about it," he said. That's a joy to which Saunders can relate more than a year after leaving the corporate world. "This is what I'd do if I could do anything," he said.